HUECU is open to all Harvard affiliates, including: faculty, staff, students, alumni, and retirees of Harvard University, Harvard teaching hospitals, and affiliated organizations. Once you become a member, your family members also qualify to be members. Your money will always be easily accessible, no matter where you are in the world. Membership is good for life, even when you graduate, move, or change employers. We’re going places, and so are our 50,000+ members. Join the credit union movement today! Check your eligibility using our partner list below. Once you’re a member of HUECU, everyone in your immediate family also becomes eligible. 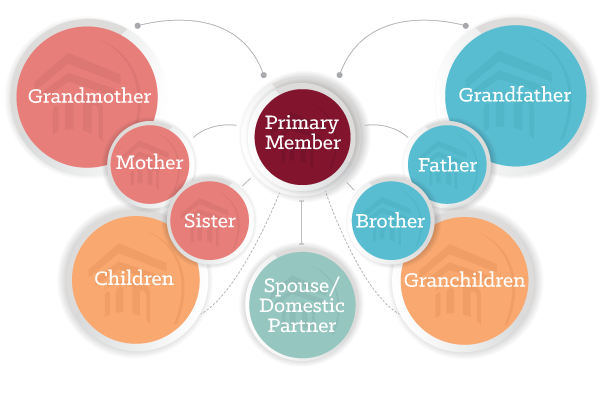 Better yet, once a family member joins, this same eligibility tree extends from them. Learn more about the philosophy and structure unique to our Credit Union. Joining the Credit Union is quick and easy using our simple Online Application Membership application.